Blogs to Check Out – Disney Babies Blog! helped to make me the blogger that I am. Next on our list is my friend Jenn’s site, Disney Babies Blog! My friend Jenn is a writer for both Chip and Company and The Magical Blogorail! Just like Beth, Amy, and Natalie, Jenn is one of the original writers for the Magical Blogorail Blue line, and has been involved in it since the beginning last November. However, Jenn also takes time out to write for Chip and Company! Over there, you can find Jenn writing about a whole lot of different subjects, but her primary focus (at least initially) was on the runDisney segment of events. Her first post was on December 26, 2010, entitled “Disney World has made me a runner”, and Jenn did complete the half marathon this past January! However, Jenn’s blog wasn’t created for either the Magical Blogorail or for Chip and Company. The reason Jenn started the blog was so that she and her friend Melissa could research and document all the tips that they needed to know to bring babies to their favorite place — Walt Disney World! What is great about Jenn’s site is that, in addition to the tips for parents, there are also other great travel tips that you can use. In addition to all of that, she also hosts giveaways and does reviews! So, if you are a Mom or Dad, and you have a baby that you are thinking about taking with you to the parks, there is a blog especially for you — the Disney Babies Blog! Blogs to Check Out – Growing Up Disney! helped to make me the blogger that I am. Next on our list is my friend Amy’s site, Growing Up Disney! When I say that this is Amy’s site, that isn’t entirely true. To be sure, Amy created the blog, and I believe she does the majority of the writing on the site, but this great Disney blog is a family blog! In addition to Amy, her brother Ridge (aka Chris) is a great writer, and even her Dad, her DisneyDad, takes his turn at writing some of the articles! Amy and the rest of the Growing Up Disney team are charter members of the Magical Blogorail! They were present in the first post that was done, on the Blue line. When the Red line formed in February of this year, Amy and the rest of the team were gracious enough to join us on the red line (I can picture Beth saying, “Amy, I need you to go to the Red line, because all of the bloggers are great, except for this guy from My Dreams of Disney.“) Well, maybe not, but it sounds funny anyway! This is a really great site, and if you have never seen it before, I urge you to take a look at it, spend some time on it, and see if you can learn how to grow up Disney at your home also! Cinderella’s Carriage – 15 Days Til Disney! Today’s picture of the day was taken in June, 2010, during our first trip to Disney with my niece Stephanie! 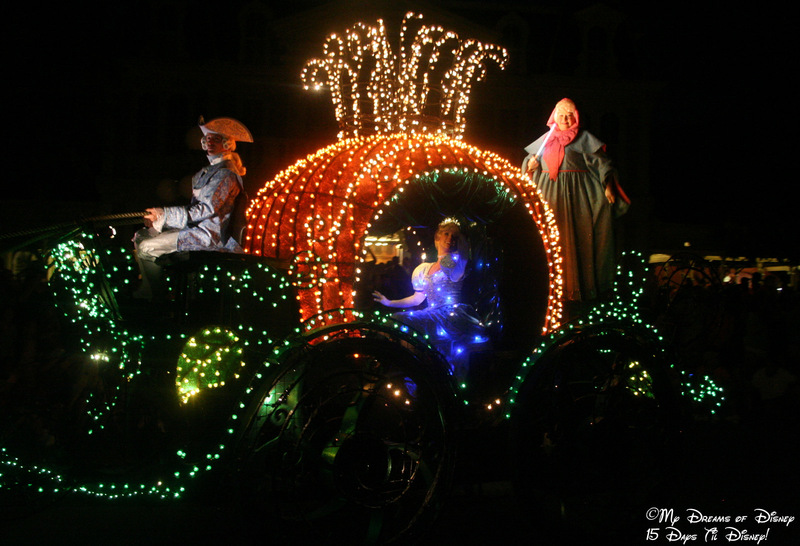 This, of course, is from the Main Street Electrical Parade, with Cinderella riding in her carriage, flanked by her driver on her left and her Fairy Godmother on the right. I like this picture because it looks like Cinderella is looking right at me for the picture! This picture is also being presented as part of my friend Deb’s Wordless Wednesday Blog Hop! If you are interested in participating, click on the image below, and submit your post, or just view the other great photos!